Jaguar has announced a range of enhancements to its XJ luxury sports sedan. 2018 model year (2018MY) updates include the introduction of the Jaguar XJR575 performance flagship model, a host of technology upgrades and the addition of the latest driver assistance features. The XJ is the pinnacle of the Jaguar brand’s sedan line-up. The luxury sports sedan delivers an unrivalled combination of Jaguar design and driving dynamics along with the ultimate in luxury refinement for drivers and passengers. The authoritative yet elegant design is formed around an aluminum-intensive architecture. Its low-slung coupe-like stance, precise lines and carefully judged proportions ensure it is instantly recognizable as a Jaguar from any angle. Inside, customers experience a perfect combination of intricate handmade details and beautifully crafted materials such as quilted Windsor leather and wood veneers alongside advanced technology. Rear occupants benefit from over three-feet of legroom in long wheelbase models. For 2018MY a new XJR575 performance flagship is available, with a number of unique exterior and interior design cues including two unique paint colors created by Special Vehicle Operations. Meanwhile, a distinctive ‘575’ intaglio and diamond-quilted seating finished with additional ‘575’ branding set the interior apart. Creating a dynamic and refined driving experience has always been key to the appeal of the Jaguar XJ. Advanced Adaptive Dynamics5 dampers adjust to suit the conditions and driving style by monitoring the car up to 500 times a second. Analyzing acceleration, cornering, throttle and brake pedal activity, and working alongside the air suspension system, the intelligent set-up can help improve body control in dynamic driving without compromising ride comfort. The XJR575 features a unique version of the Jaguar 5.0-liter supercharged V8 engine. Delivering 575hp and 517 lb-ft of torque, the engine powers the car from 0-60mph in 4.2 seconds (0-100km/h in 4.4 seconds) and on to a top speed of 186mph (300km/h)1. The 25hp power increase is the result of enhanced engine calibration. Steering feel and vehicle dynamics are enhanced by the application of electric power-assisted steering (EPAS) for rear-wheel-drive models. This set-up also underpins a range of available advanced driver assistance systems (ADAS) including perpendicular and parallel Park Assist, Lane Keep Assist, and Driver Condition Monitor5. All-wheel-drive (AWD) technology assists drivers in adverse weather conditions. The advanced system reacts to road conditions and can help deliver traction where it is most needed. Should the rear wheels begin to slip the system is designed to automatically redistribute torque to the front wheels4. In low grip conditions, the All-Surface Progress Control (ASPC) system becomes especially useful for RWD models. Developed for low-speed driving in adverse conditions, ASPC is designed to manage the brakes and throttle to deliver the best possible traction for the conditions at hand, assisting the driver in getting the vehicle to pull away smoothly: all the driver has to do is steer5. ASPC is fitted to all models and operates between 1mph (3.6km/h) and 19mph (30km/h) with the driver using the cruise control switches to select and maintain the desired speed. Alongside the tradition and craftsmanship of the Jaguar XJ is a host of technology, including the seamless and intuitive Touch Pro infotainment system. The in-house developed technology provides features such as door-to-door navigation, 4G Wi-Fi2 and an available 1,300W Meridian™ Reference audio system. This can all be accessed through the 10-inch central touchscreen with smartphone-like usability for greater ease-of-use6. Touch Pro features a high-performance quad-core processor and runs on an ultra-fast Ethernet which offers exceptional data transfer rates. Combined, they deliver incredible graphics and fast response times6. The latest in stereo camera technology enables a number of available advanced driver assistance features such as Emergency Braking, Lane Departure Warning and Lane Keep Assist systems. Adaptive Cruise Control with Queue Assist takes the stress out of highway driving in stop-and-go traffic by tracking the vehicle in front, at a pre-determined distance5. The XJ is manufactured at the Jaguar Land Rover Castle Bromwich plant, alongside the F-TYPE sports car, XF sports sedan, XF Sportbrake and XE sports sedan. The dynamic shape of the Jaguar XJ is the result of exhaustive computational modelling in which designers and engineers have worked side-by-side to ensure that aesthetics and aerodynamics work in harmony. Starting at the front of the vehicle, the upright grille with mesh detail framed by ‘J-Blade’ daytime running light design creates an assertive stance. In profile, the distinctive chrome accent of the window opening emphasizes the vehicle’s pure and elongated form while the taut waistline accentuates the vehicle’s low stance and commanding presence. The vehicle’s lightweight all-aluminum construction reinforces the precise and pure lines of the XJ exterior. With fewer joints and welds than traditional methods, it is also key to the luxury sedan’s dynamic performance and refinement. 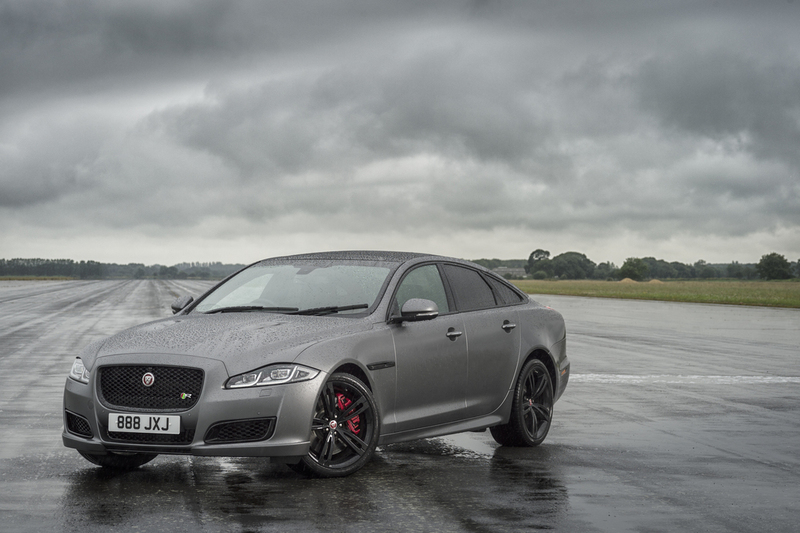 The dynamic appearance of the XJ has been enhanced with the introduction of the XJR575. A number of unique exterior design elements set it apart from the rest of the range. These include two exclusive exterior paint colors, Satin Corris Grey and Velocity Blue, created by the Jaguar Land Rover Special Vehicle Operations division. Further exterior enhancements include a revised rear spoiler, side sills, front bumper, splitter and lower air intakes featuring Gloss Black surrounds. Distinctive XJR575 exterior badging also helps to mark the vehicle out, while 20-inch 5 Split-Spoke ‘Style 5044’ gloss-black wheels with red painted brake calipers give it a final dramatic flourish. Eye-catching full-LED headlights accentuate the ‘quad lamp’ design feature that Jaguar sporting sedans have made their own. They are further enhanced with active front steer and static bend lamp functions, and auto high beam-assist. LED headlights provide a more natural light than Bi-Xenon lamps, improving visibility, driver comfort and energy efficiency. The cabin of the XJ blends elegant, contemporary design with the comfort, luxury and unmistakable sporting style of a Jaguar. Both standard and long-wheelbase (LWB) models are available, with the latter offering a more sumptuous and refined experience for rear-seat passengers. The exceptional crafted feeling that is now synonymous with Jaguar, and the XJ in particular, is evident throughout the vehicle. Handcrafted veneers run around the cabin, emphasizing the sense of space, while the layered instrument panel, complete with Jaguar signature ‘Riva Hoop’, continue into the door panel, creating a unique atmosphere. The Jaguar brand’s sporting character is visible in the controls and architecture surrounding the driver, with a finely crafted leather-wrapped three-spoke steering wheel providing a rewardingly tactile touch point. A glass panoramic roof guarantees a light-filled cabin, enhancing the sensation of space. The heat-reflective glass roof sweeps to the full rear of the vehicle and above the rear seats, flooding the interior with natural light. This adds to the spacious feeling of the interior but effective tinting techniques ensure the cabin remains private while simultaneously minimizing solar gain. Further attention to detail is a hallmark of the XJR575 model’s sporting design and contemporary luxury. For even greater comfort, the sport seats feature adjustable bolsters for enhanced lateral support during cornering while the diamond-quilted upholstery has embroidered ‘575’ branding. The dashboard intaglio also has ‘575’ branding and unique XJR575 front and rear treadplates are fitted to the interior door sills. The rear passenger compartment of the LWB models equipped with Premium Rear Seat Package includes two individual ‘airline style’ reclining seats featuring cushion and squab adjustment, three massage programs (wave/rolling, lumbar and shoulder), lumbar adjustment and two memory settings for the ultimate relaxation on long journeys. The rear seat home positioning setting returns each seat to its rest position at the touch of a button on the door panel, easing entry and exit. The center armrest, which can be stowed in the upright position to allow the use of the center seat, houses all the seat controls as well as the Front Seat Activation button, which gives rear passengers control of the front passenger seat position. Through the use of the central infotainment touchscreen, any one of the four electric seats can be selected and then fully controlled via the driver’s seat switches. The rear seats can be returned to their home position by the use of the touchscreen and driver’s memory buttons, and can also be programmed to return to their home position on rear door opening for ease of entry and exit. Rear-seat passengers are provided with a wide range of entertainment features. The optional Premium Rear Seat Package includes two 10.2-inch high-resolution screens mounted on the back of the front seat headrests. These can display inputs from multiple sources; the built in DVD player, or an external media player that can be synchronized through the Rear Media Interface, which provides USB and HDMI/MHL connections. Audio can be transmitted through the wireless headphones, allowing each passenger to watch separate entertainment sources. The rear seat environment, including the entertainment, is managed by a wireless controller housed in the center console, which also allows passengers to fine-tune their individual climate zones and seat heating and cooling functions. LWB models equipped with Premium Rear Seat Package also feature leather-surfaced business tables in the rear, which fold out of the backs of the front seats. To keep rear seat passengers shielded from the sun, and to offer additional privacy, the XJ offers electric rear-side window blinds that are operated using the window lift switches. Generous rear headroom gives passengers limousine levels of comfort. The palette of materials for the interior underlines the vehicle’s luxurious feel. This includes soft grain and quilted soft grain leathers, and a wide choice of veneers including Piano Black, Carbon Fiber, Gloss Burl Walnut, Gloss Rich Oak, and Gloss Figured Ebony. The vehicle’s sense of effortless performance is maintained by the latest-generation of the Jaguar brand’s all-aluminum supercharged V6 and V8 gasoline engines. All feature direct injection, variable valve timing, forced induction and intelligent stop-start systems to the level of performance expected from a Jaguar product. The 3.0-liter supercharged V6 develops 340hp/332 lb-ft of torque and is available with rear- and all-wheel drive. Characterized by its linear power delivery and free-revving nature, this remarkable engine also produces a unique soundtrack thanks to meticulously tuned intake and exhaust systems. The flagship engine option remains the iconic Jaguar 5.0-liter supercharged V8. For 2018MY this engine produces 575hp and 517 lb-ft of torque in the new XJR575 performance flagship, enough for a 0-60mph time of 4.2 seconds (0-100km/h in 4.4 seconds) and a top speed of 186mph (300km/h)1. This engine is also available with an output of 470hp/424 lb-ft to deliver all of the performance promised by the vehicle’s dynamic design. All powertrains feature a specifically optimized eight-speed automatic ZF® transmission. Each has been developed to provide the perfect balance of unrivalled launch performance, shift comfort and vehicle dynamics. Two variants from the ‘8HP’ transmission family are offered in the XJ: the familiar 8HP70 transmission and the lighter, more compact 8HP45. Jaguar cars offer exceptional steering feel within their respective segments. This is intrinsic to the dynamic DNA of all models, from the XE compact sports sedan to the F-TYPE sports car and F-PACE performance SUV. The XJ is no exception and the latest generation benefits from the use of electric power assistance for the steering system for rear-wheel drive models. Years of development and testing, plus meticulous tuning work, means that EPAS delivers a natural and engaging steering feel. The system’s ability to filter-out steering disturbances from poor road surfaces and compensate for road camber make it feel smoother and more precise than ever. Friction has also been engineered out, improving feel and responsiveness even further. Conceived in-house and built around a quad-core Intel processor and a next-generation Ethernet network, InControl Touch Pro™ is designed to handle large amounts of data and is exceptionally powerful and responsive. At the same time, the system is simple and intuitive to use6. At its heart is a new 10-inch capacitive touchscreen introduced for 2018MY. Just like a smartphone, the home screen can be customized – there’s a choice of wallpaper images, while widgets can be used to shortcut to favorite features and functions6. Extra home pages can also be added, if desired. Similar to smartphones, the touchscreen accepts ‘pinch to zoom’ gestures, or swipes to scroll between home screens6. This simple, intuitive user interface has been utilized in an effort to minimize distraction. The functionality of the navigation system is just as impressive6. Dead reckoning functionality is designed to determine the vehicle’s position even when GPS signals cannot be received. Touch Pro also enables door-to-door route planning and guidance, including public transport options. A companion app allows you to plan your route at home and then load it into the system at the start of the journey. The system also offers a Commute Mode, which learns your daily drive to work and automatically suggests alternative routes to avoid congestion using historical and real-time traffic information. Approach Mode displays a 360-degree interactive view of your destination within 656ft (200m) of arrival, and can direct the driver to the nearest parking lot. Touch Pro also delivers a full-screen navigation display in the vehicle’s reconfigurable 12.3-inch Interactive Driver Display6. Equal attention has been paid to audio system performance. A choice of two systems includes the outstanding 26-speaker, 1,300W Reference sound system developed with British audio experts Meridian. The 17 channels of stereo and surround sound benefit from Meridian’s Trifield™ technology to ensure optimum reproduction with benchmark low levels of distortion. To further enhance the luxurious experience of second row XJ passengers, customers will be able to specify a rear seat entertainment system. Comprising of two 10.2-inch high-definition screens, which fold away when not in use, these displays offer a true 16:9 widescreen aspect ratio. The rear seat entertainment system also allows passengers to connect devices using two USB ports, one HDMI and one MHL port, enabling charging and media output from a wide range of smartphones and tablets. Ensuring that occupants are always connected is key to the Jaguar brand. Using the vehicle’s antenna for the strongest, most reliable signal, the XJ can function as a 4G Wi-Fi hotspot2, providing a connection for up to eight devices. InControl Apps, enables customers to seamlessly connect Apple® and Android™ smartphones to the vehicle’s infotainment system, via a USB cable. InControl Apps provides access to compatible apps on the device using the vehicle’s touchscreen6. InControl Remote, enables customers to connect with the XJ using their smartphone, so they can check how much fuel is in the tank or if the windows have been left open. Within the app, customers can also remotely lock or unlock the car and receive alerts if the alarm goes off. The app also enables the driver to bring the cabin to a pre-set temperature by remotely starting the engine using their smartphone. Should the driver forget where the car is parked there’s a map to lead them straight to it. InControl Protect will automatically notify the emergency services and provide the vehicle’s GPS location should the car be involved in a collision severe enough to trigger the airbags. Occupants can also trigger an emergency call manually simply by pressing a button. Currently offered on the Jaguar XE and XF sedans, the 2018MY XJ will now also benefit from the brand’s All-Surface Progress Control (ASPC) technology. Designed to help drivers to pull away smoothly on very low-friction surfaces, ASPC makes it easier to drive at low speeds on slippery surfaces such as snow, ice and wet grass5. Conventional traction control systems attempt to modulate what happens once the wheels begin to slip which can be too late. ASPC is fundamentally different, founded upon decades of Jaguar Land Rover experience in developing off-road technologies. ASPC works like a low-speed cruise control and can operate between 1mph (3.6km/h) and 19mph (30km/h). Pressing a button on the center console activates the system. The driver then uses the cruise control switches on the steering wheel to set the desired speed and ASPC controls throttle and brake inputs; the driver would manage the steering5. What makes ASPC so effective is that it doesn’t just provide fine control of the throttle: it also uses the brakes in opposition to the throttle. So from a standstill, only very low engine torque is applied to the driven wheels, enabling smooth progress with little or no wheel spin. ASPC is compatible with rear- and all-wheel drive and is made even more effective by the fitment of winter tires. The 2018MY XJ benefits from the introduction of the Jaguar Land Rover advance stereo camera technology, which underpins an extended range of driver technologies. Sensors within the system are packaged in front of the rear-view mirror and generate a real-time view of the road and objects ahead. The information is interpreted by highly sophisticated image processing software and the output used by a wide range of advanced driver assistance systems. Emergency Braking (AEB), standard on rear-wheel drive models is designed to mitigate the outcome of vehicle collisions. If the controller detects a collision with a vehicle ahead is likely, the brake system is primed and the driver is given audible and visual warnings. If no avoiding action is taken and a collision is deemed to be imminent, emergency braking is initiated based on the vehicle’s speed of travel to help avoid or mitigate the impact5. The stereo camera also enables the Lane Departure Warning (LDW) and Lane Keep Assist (LKA) technologies on rear-wheel drive models as standard. By monitoring the vehicle’s position relative to lane markings either side, LDW is designed to prevent unintentional lane drift by triggering a visual warning in the instrument panel and a haptic warning through the steering wheel5. If the driver begins to drift too close to the edge of the lane they are driving in, the LKA system is designed to guide the driver back in to lane by applying a small amount of corrective counter-steering5. The amount of torque applied to the steering wheel is slight and can be easily over-ridden by the driver. Drifting out of lane can be caused by driver fatigue, and this can be identified by periods of little or no steering activity followed by sudden or excessive inputs. The new Driver Condition Monitor system, equipped to rear-wheel drive models as standard, is designed to recognize these patterns, and, by also checking activation of the brake and accelerator pedals along with various instrument panel buttons, will display a multi-stage visual warning in the instrument panel to prompt the driver to take a break5. The standard Traffic Sign Recognition (TSR) system relies on a forward-facing camera to keep the driver informed of speed limits – including temporary limits, which may be in force through construction zones, and variable limits on highways5. Camera data is compared against GPS data, enhancing accuracy and robustness. When driving through areas where speed limits change frequently the driver can easily become confused as to the current limit. To make life easier the Jaguar XJ features an Adaptive Speed Limiter: this feature uses TSR system data to adjust the set point and is designed to automatically increase or decrease the vehicle’s speed5. If the TSR system recognizes a higher speed limit ahead, the system notifies the driver and the vehicle can accelerate smoothly up to the new limit. If the speed limit is lower, the vehicle can be slowed down accordingly using engine braking5. The Queue Assist function for the adaptive cruise control system has been designed to take even more of the effort and monotony out of driving in heavy traffic. Using a long-range radar sensor, the system can help maintain a pre-set distance from the vehicle in front, all the way down to a standstill5. Standard on all-wheel drive models, Blind Spot Monitoring uses radar sensors to alert the driver to the presence of vehicles approaching fast from behind when changing lanes by displaying a flashing icon in the door mirror5. Taking Blind Spot Monitoring a step further, a new Blind Spot Assist feature is standard on rear-wheel drive models. If another vehicle is detected in the blind spot of the E-PACE and the driver attempts to steer into its path, Blind Spot Assist is designed to apply corrective steering torque to prevent the lane change. The driver is simultaneously alerted by a flashing LED in the corresponding side mirror. If necessary, the driver is able to override the corrective steering torque. The use of electric power-assisted steering enables semi-autonomous park-assist functions for both perpendicular and parallel parking through the available Park Assist feature. Ultrasonic sensors measure the space first and the system steers the vehicle into position – and, in the case of parallel parking, out again5. The driver just controls the accelerator, brakes and transmission. The XJ also features an available Surround Camera System: four cameras combine to give a 360-degree view of the area around the car to aid in maneuvering5. Radar sensors on the XJ can also help when reversing. Vehicles approaching from either side are detected and, if they present a potential hazard, the driver is given audible and visual warnings5. (2) The Wi-Fi hotspot is intended for passenger use only. InControl features may require an additional subscription with separate terms and conditions. (4) This feature is not a substitute for safe and attentive driving, nor can it overcome all extreme circumstances. Please consult the owner’s manual or your local authorized Jaguar Retailer for more details. (5) These features are not a substitute for driving safely with due care and attention and will not function under all circumstances, speeds, weather and road conditions, etc. Driver should not assume that these features will correct errors of judgment in driving. Please consult the owner’s manual or your local authorized Jaguar Retailer for more details. (6) Do not use Jaguar InControl® features under conditions that will affect your safety or the safety of others. Driving while distracted can result in loss of vehicle control.